Head teacher identified that the school was in active unhealthy and not used to active lifestyles. Effects of personal health, understanding and ability to manage weight and body composition. She approached Scoot Fit to come in and change the schools outlook on being healthy, being active understanding their bodies as well as improving skills , confidence, physical fitness and improving healthy habits. Why did you chose to have a Scoot Fit Experience Day at your School? We have a wide curriculum in school but feel that exercise is the key to a healthy mind and the scooter day seemed a really fun way to get children (and staff!) involved in exercise. How did they children respond to the experience day? It has been a great success. I know of children who have gone out and purchased a scooter after the day. I would recommend it to any other school to try. We have received a lot of positive feedback from parents. What impact did Scoot Fit have on your School? The children enjoyed it and have asked for other similar days. 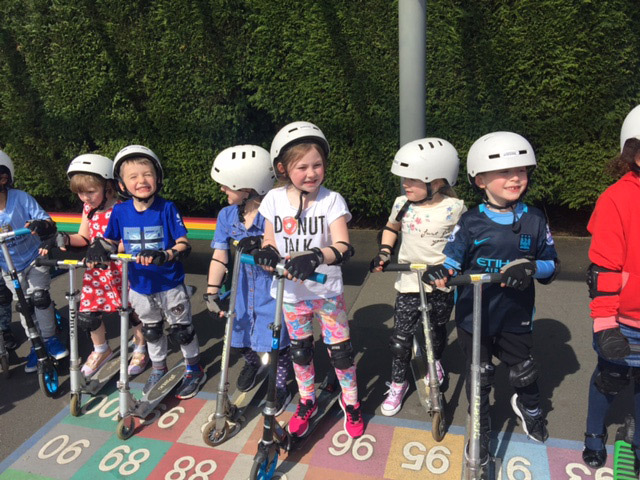 “Scoot Fit was a new, fun, challenging, and exciting sporting activity for our children to experience. We didn’t know what to expect because we had never heard of Scoot Fit or knew how to use scooters as a form of physical fitness. However, we were delighted with the program and outcomes. Scoot Fit was safe, structured and we saw an increase in physical fitness, confidence, self-esteem and enjoyment. Children were able to feel and realise the difference in their scooter skills and abilities as the program progressed, having a hugely positive impact on all children’s physical and mental wellbeing. The using of Scoot Fit as a structured and sequential PE program meant that children made clear and easy observe progress in lessons. The Scoot Fit program took children with different levels of ability and developed their levels of skill from beginners to advanced. Their balance improved as they moved faster and negotiated bends and turns at a faster pace around the track. Co-ordination was improved greatly by seeing children going from only being able to use a single leg to accelerate and brake, to being high capable and confident in alternating their pushing leg to accelerate steer around corners and to perform different types of stops. The sessions were engaging and interesting. Firstly, because the majority of children already had a passion or fondness for riding scooters. Secondly, it was an activity all children could relate to so engagement levels were easily maintained. 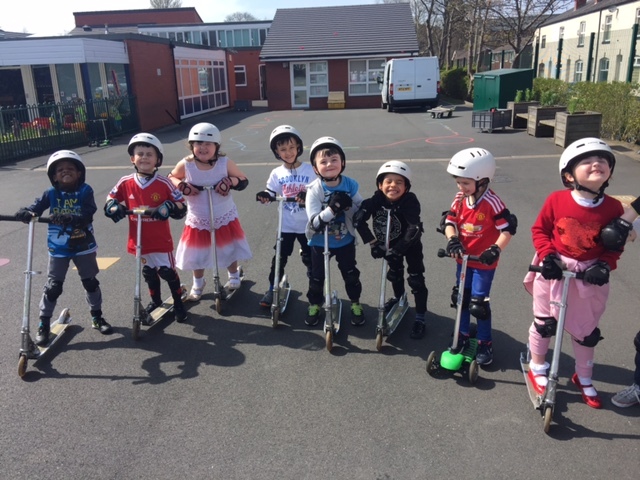 The children found Scoot Fit interesting because they valued the skills and techniques being taught because they could use them outside of PE lessons. It was especially rewarding for children that didn’t excel at the more popular and traditional sports. Everyone had the same equipment and started at the same place in terms of learning. The level of sporting ability is varied in our year 5 & year 6 classes. We have children playing for professional football teams, children who represent the school in football, netball and athletics and children who don’t participate in any sports outside of PE. My expectation was for the children with sporting pedigree to lead from the front, demonstrating and adopting the skills and techniques learnt at a fast rate. However, it didn’t work out like that. We saw a new crop of children come to the fore, displaying skills and confidence unseen before in PE. It’s was fantastic opportunity for children who weren’t the fastest, or the best at football or netball, to display their own sporting uniqueness. These children gained a new found sporting recognition from their friends. The physical effects of children participating in Scoot Fit were excellent. They all had to work hard scooting and were often sweating, breathing heavily and noticing their leg muscles were working hard and getting tired. We have different levels of fitness in both classes, however everyone had to take breaks to recover from tiredness before carrying on. The physical exertion is also independent to that particular child, which is great. Meaning each child, regardless of their own fitness levels and abilities were able to challenge themselves and push themselves further. They could do this without an obvious comparison to how their peers were performing and not feel the pressure to perform to the same level as higher ability children. Children got used to personal challenges and became more confident in pushing their personal limits. They all worked to the best of their ability and felt the effects of vigorous exercise and got noticeably fitter as the weeks went on. This was particularly noticeable in their speed, power and endurance levels. We saw all children build resilience, courage, bravery and overcome adversity throughout the pilot. As the children’s confidence grew so did their risk taking, for example children who were scared about taking their foot off the floor in their first lesson because they were afraid of losing their balance, were jumping off launch ramps by the end of the pilot. Amazing to see! Lots of children from different classes were very disappointed they were not taking part in the pilot. However, they were happy know that there was also a Scoot Fit after school club. This club proved to be very popular and sparked a whole school interest and desire to take part. Thirty-five children were allowed for each session however the club had a waiting list of children wanting to attend due to its popularity. The club was enjoyable, fun, engaging and children got to socialise in a physically active environment with younger and older children together. The children were really excited about their Scoot Fit lessons, so excited it was a challenge keeping them focused beforehand! But after taking part and getting that release of energy and feeling of satisfaction we found the children were able to focus and concentrate much more in class. We often had children asking ‘Why can’t we do this everyday’? Overall myself and the children really enjoyed Scoot Fit and would recommend it to any school. If you’re looking for a new way to engage children in a sporting activity this will be good. It’s new, safe, popular, exciting and challenging as well as being able to make everyone feel included”. The Scoot Fit program developed a wide range of physical skills and made our children aware of what being healthy is. One of the most noticeable parts of the program was that children improved their own levels of personal challenge. They wanted to get better and better and demonstrated high levels of aspiration that grew and grew through each week. Each child strived to reach lesson goals and personal goals that were all different for each of them. Children were always excited in a build up to their weekly lessons. They were always enthusiastic and willing to learn all the skills that were being delivered in program. The program met a wide range of targets and areas of the National Curriculum for Primary PE and made a noticeable difference from start to finish on children skills, techniques, and confidence in learning something new and innovative. The Scoot Fit program also improved children’s balance and co-ordination from the swapping of feet to push and accelerating them, and to keep on their scooters when going around corners and breaking. It was accessible for all children and provided an alternative to activities such as gymnastics and dance, activities that work on the similar health and fitness characteristics as these. The feeling of adventure, being outdoors and personal challenge previously mentioned also linked in very well with what Scoot Fit provided. Children also had a huge opportunity to improve their evaluation skills, review their work and the work of their classes mates in the Scoot Fit sessions. They were also given the chance to think of targets to improve their skills, techniques and tactics. Scoot Fit had a very positive and obvious impact on Lindow Primary School’s health and Wellbeing. Children were very active in their session, bright red cheeks, sweat and heat rates all going for it! They were taught how to take their heart rate, and what it meant have a healthy heart and how it linked in with using their scooter. The program helped them become aware of what being healthy looked and felt like and most importantly the enjoyment of being fit and healthy. Children were smiling and felt good about themselves after each of their Scoot Fit sessions. It was especially rewarding for particular children. Our children who usually shy away from sports, and the more popular of sports. The children went from quite to confident and excelled at a new activity that most children all started at the same time on a level playing field with. These quieter children had the chance to really push themselves, improve their fitness levels independently and raise their aspiration level for PE. Our children had a less negative attitude towards PE from taking part in Scoot Fit. Everyone wanted to take part. It was exciting to be taught by someone new, different and a specialist in delivering the session meaning that the quality of the session was excellent. With this improved attitude towards PE from doing Scoot Fit children were noticeably supportive towards their peers in classes. Activities such as equipment challenges in pairs and giving each other praise for their achievements all helped contribute their attitudes. We noticed with particular children that their self -esteem grew hugely as a result of Scoot Fit. Because all children were starting at the same level it meant that they could progress and keep up with the progress that our gifted and talented sport children made. They felt a part of the improvement and the progress being made with others in the class. This helped them to overcome anxieties and made them feel comfortable and happy in each of the sessions. Self-belief and finding out they can succeed from trying something new was also very noticeable with some of children also. It was exciting it was being delivered by new staff, and it gave amazing opportunities to our disadvantaged and pupil premium children to take part at the same level as their peers. Having all the equipment provided by Scoot Fit allowed this to happen. It closed up socio-economic and cultural gaps. It was also accessible for children with EAL as all tasks were demonstrated and modelled to their children to maximise their understanding of what was being done. We noticed a big increase in children attitudes towards being healthy and active in their own time. Children were buying their own equipment for scooting and taking part in it as part of their own leisure time outside of school. They would often comment on them practicing what they had done in lessons outside of school. Scoot Fit helped children to improve their cardio vascular fitness as well. Their levels of endurance went up as they improved their skills and techniques on Scooters, meaning they could go faster and further for longer. Improvements in the children’s agility was also noticed from taking part in Scoot Fit. They were able to steer around corners and change their direction with more accuracy and speed from week to week as a result of what they had been doing in their sessions. Children were able to concentrate more effectively when doing practical activities like Scoot Fit as well as in other lessons. This was also highlighted by our school student councillors. Join the Revolution and we support you all the way.